We are all creative. What most of us lack is the time and space to BE creative. We pull our boxes and bags of supplies out of the closet, organize them on the kitchen table, and — just as we get settled to create something (in between all those family distractions) — it’s time to make dinner! So we clear the table and criticize ourselves, saying “I’m just not creative,” when in fact we haven’t done anything but organize our supplies! I can’t tell you how many women have lamented to me, “I am not creative. I can’t even draw a straight line!” I can tell from the tone of their voices and the look in their eyes that they know they are missing a deeply satisfying aspect of life. When I teach my Cre8tive Flow “playshops”, my greatest reward is the look of surprised pride and joy on a participant’s face when she shows off her creation. Creativity occurs in any situation or endeavor. Whenever you find yourself thinking, “Time just flew by!” or “Where did the time go?”, you were likely “in the flow”. There is a sense of timelessness and ease that happens when one’s attention is totally absorbed in something. Creativity happens when one is gardening, cooking, solving a problem, playing with children, rearranging furniture, beginning a new enterprise, creating art, deciding on an outfit to wear, writing, designing a home… well, really, anytime! 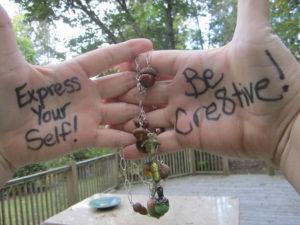 Each and every one of us is creative! 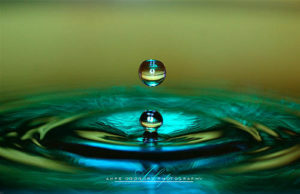 We express it in different ways according to our own deep Self’s expression. It is one way we show that we are individuals with different talents and interests. And creativity has a ripple effect: when you are creative in one area of your life, it flows into other areas of your life – as well as to other people. For me, creativity is a direct connection to Spirit. When I create, it is an active meditation. I am in the “flow”, and I am addicted to that timeless space! My primary inspirations are Nature, the Feminine Divine, and exploration of the Self. I cherish diving into the creative depths to explore my own self-expression. Come on, dive in! The water’s fine!